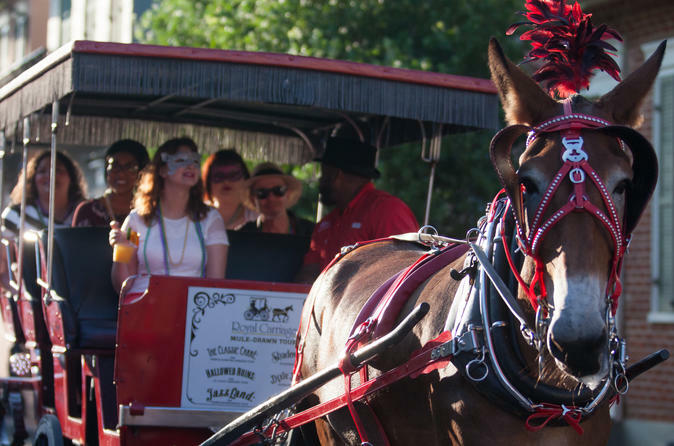 This mule-drawn carriage tour is as iconic to New Orleans as a steamboat ride or a plate of beignets! If you are looking for a fantastic way to explore the French Quarter and learn about the fascinating history of this unique city, an authentic mule-drawn carriage tour is guaranteed to be the highlight of your trip! On this tour, you'll enjoy a shared carriage ride on one of our larger group carriages. Our top-rated tour guides double as skilled carriage drivers. With the assistance of their trusted mule, you'll cover way more ground than any 2-hour walking tour and see as much of the French Quarter as possible in just 1-hour. Instead of a boring history lecture, carriage drivers create fun fact-filled engaging tours for all to enjoy. You'll see landmarks such as St. Louis Cathedral, Jackson Square, The French Market, and so much more! With so much to see and do, make sure that a carriage ride is on your list! All aboard! All group carriage tours board at the carriage stand located at 700 Decatur Street. All tour participants must check in with a Royal Carriages Representative at least 5 mins prior to your reservation time. He or she can be found near the beginning of the line of carriages under the red umbrella wearing a bright red company shirt. Boarding for all group carriage tours may take up to 15 mins. Let's ride! As your carriage departs from Jackson Square, your driver/guide will regale you with stories of the city's founding as the carriage passes through the historic French Quarter streets, past landmarks such as Saint Louis Cathedral, Jackson Square, Napoleon House, and more. Expect stories that are both historical, entertaining and appropriate for all visitors. Optional Cemetery Tour! Carriage Tours booked between the hours of 10:00 am - 2:00 pm include a visit to Saint Louis Cemetery #1. After a 1-mile carriage ride, your carriage will park outside of the gates of Saint Louis Cemetery No. 1. You'll disembark the carriage and follow your driver/guide on a 15 to 20-minute walking tour of the cemetery where you'll discover why New Orleans uses above ground burials. The most famous burial in all of New Orleans is where the Voodoo Queen, Marie Laveau, was laid to rest. Your carriage driver will show you this sought-after tomb and explain to you the story of Marie Laveau, in addition to answering questions you may have about the religion of Voodoo. Optional Neighborhood Tour! While Carriage Tours booked after 2:00pm do not include a visit to the cemetery, they do include a visit to a second historic neighborhood known as the Faubourg Marigny. This route gives visitors an opportunity to see more of New Orleans. This Creole Neighborhood, adored by lovers of architecture, is known for its colorful bohemian Creole Cottages, Shotgun Homes, and the Grand Mansions of Esplanade Avenue. This route also features Frenchmen Street, which is "where to locals go" for live jazz and more. Get back! After exploring one of the above mentioned destinations, you carriage will reroute itself back through the beautiful French Quarter before returning to Jackson Square.